Located opposite to Playa del Carmen in the Riviera Maya, Cozumel stands out as a touristic island. It is rich in Mayan ruins and heritage, and is a famous scuba-diving destination for the transparency of its waters. On the northern coast, which covers several kilometres, a number of salt-watered lagoons with mangrove swamps and flats are the home of countless bonefish whose big size raise your eyebrow. Bonefish fishing is very profitable all year round and it requires a good command of casting and, above all, precision. Permit are also usually found, and you may want to try flyfishing for Dolphin or Sailfish in April, May or June, with big chances of success. Located opposite to Playa del Carmen in the Riviera Maya, Cozumel stands out as a touristic island. There is an international airport on the island and the access from the continent is very easy, as there's a ferry service offered every hour leaving Playa del Carmen. The journey takes a bit more than half an hour. Cozumel island, rich in Mayan ruins and heritage, is a famous scuba-diving destination for the transparency of its waters. On the northern coast, which covers several kilometers, a number of salt-watered lagoons with mangrove swamps and flats are the home of countless bonefish whose big size raise your eyebrow. 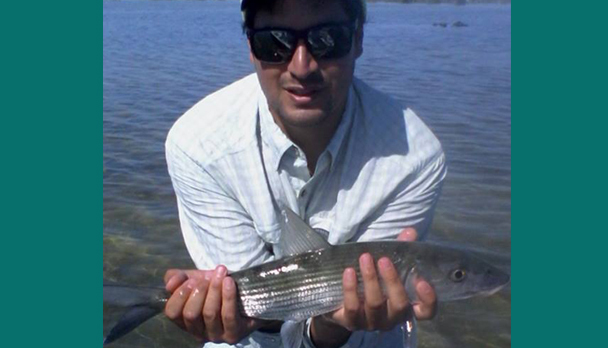 Bonefish fishing is very profitable all year round and it requires a good command of casting and, above all, precision. Permit are also usually found, and you may want to try fly fishing for Dolphin or Sailfish in March, April, May or June, with big chances of success. 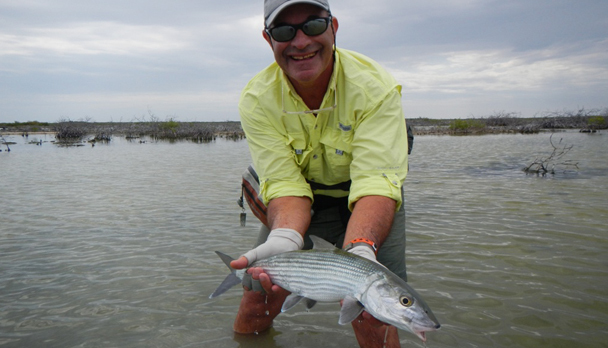 Many lagoons and a great part of the coast allows wading to fly fish for bonefish. You can also catch baby tarpon, small jacks, snapper and barracuda, apart from bonefish and permit. Although Cozumel is a very popular tourist destination, the area of the lagoons and flats cannot be reached by land. Therefore, the fishing is not subject to any pressure and catch-and-release behavior is required. There are few fly fishing guides who are well-qualified and work in a professional way. 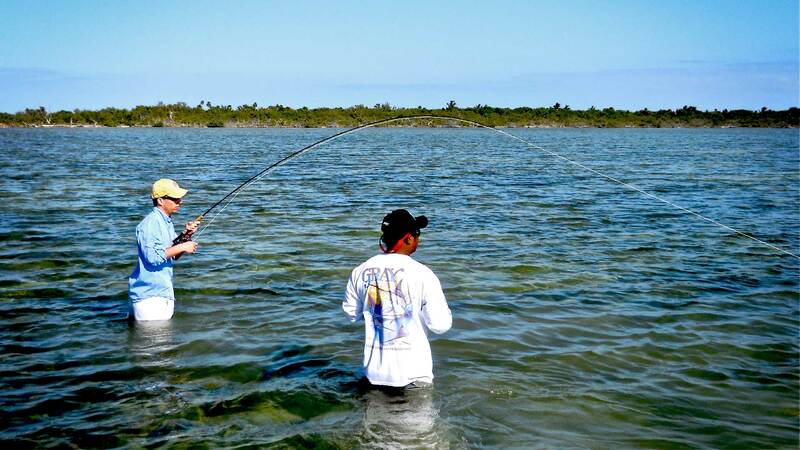 Fly fishing Cozumel lagoons and coast demands hooking fish on sight; that is why a good level of casting and precision is needed to enjoy this exciting and challenging fishing. The package includes 8 hours of float trip and fishing guide, lunch with sandwiches, refreshments and beer. Outings start very early in the morning to take advantage of the profitable tailing during the early hours, starting at 5 or 6 am to 2 or 3 pm. The rest of the day is free so that you can relax or enjoy it with your family. Tackle for this fishing includes a #8 Wt rod and saltwater floating lines; high performance reels with a good brake system, 10-to-12-foot-long leaders for bonefish, preferably made of fluorocarbon with 10 or 12-pound tippets, flies in hooks #8 and 6 Crazy Charly type or Schrimp varieties in brown, pink and tan. Open-sea fishing (Dorado and Sailfish) requires rods #12 Wt and fluorocarbon leader. 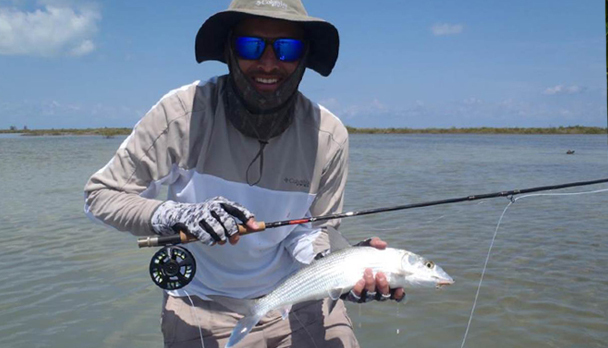 In case you just want to catch bonefish and you do not want to carry the whole tackle with you, our guide will hire all the equipment at a reasonable price. We recommend taking fast-drying light clothes, a cap with neck protector, neoprene boots for wade fishing and polarized glasses, which are essential for spotting fish. Sun block, SPF 40 or higher. Light water-proof jacket. Insect repellent. Rates include: Boat and guide, fishing licence and lunch box with sandwiches and beverages. Rates do not include: Fishing equipment and flies; personal health insurance and gratuities. Notes: Please consult on our rates for Deep Sea Fly Fishing!!! The weather was mostly sunny and warm, but some windy days made the fishing a bit slower. Some nice bonefish were caught, snapper and barracudas. There were many permit schools around but due to the wind casting wasn't good enough. Dear Daniel, the fishing in Cozumel was a wonderful experience, I went out with Nacho's son who is also a very good guide. I hooked some bones and lost some as well since they kept on cutting the line, I also got to see permit and when I tried to cast at them I put really nervous and the line felt on top!!! That night I wasn't able to sleep... Thanks again for the fishing trip! My first time in saltwater, SPECTACULAR! I had a great time, 10 points! Being my first experience I was more than satisfied; 12 bonefish, 2 small "picudas" and 2 jacks. Nacho, the guide did the impossible to make me fish tarpon but they weren't eating... they were just in front of me! Daniel, I had a great time fishing with Albert & young Nacho, they put me onto more bonefish than I have ever seen at one time. One of the first places we went to had around 7or 8 schools of 20 to 30 bonefish, running up & down the bank stopping in front of us and tailing. If my casting had been better I'm sure I would have landed a lot more fish. 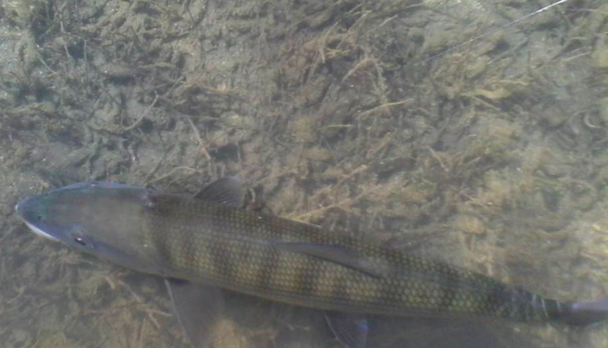 All told, I did land at least 6 nice Bonefish, on flies, most of them in the 5 and 6 pound range. Of course I lost a couple, I like to think of as long line release. The guides were very professional and knowledgeable, always spotting fish way in front of me. I think Cozumel could be considered as a great place to Bonefish, the shallow lagoons were great to wade in or even pole around in. I would definitely suggest to anyone planning a trip to Cozumel to line up at least one day with Nacho and his sons to go for a fun day fishing. We were into Bonefish all day. On the way back from the lagoons, I had chances for some cast to Permit, Barracuda and even a Sand shark. Cozumel, what a fabulous day ! as we meet his wife and he explained we were headed to the marina. Upon arriving Nacho informed us we would be guided by his son Nacho JR and his other son Alberto, I was a little hesitant after hearing how good a guide Nacho was, but figured his sons would be just as good. It should be mentioned all in the Eaun family are very nice, friendly people. We loaded the boat and headed to the lagoon, Alberto had explained he had several great locations he was going to take us to. We beached the power boat walked across a small lagoon to be met on the other side by Alberto in a flats boat, then the day began, it wasn't 30 minutes later that he had me throw to a spot where he said he saw bonefish, I saw nothing, next thing I know my reel is singing and it's game on! We continued in the first lagoon, at one point seeing baby Tarpon chasing shrimp up against the mangroves but they weren't interested in flies, they had shrimp on their minds. wade closer to have a better opportunity, i threw my best cast(still need to practice that) and 2 more casts later another bonefish! We worked that spot for two hours, pulling bonefish after bonefish outta there. My wife had started fishing from the boat with Nacho and was having similar good fortune,then she landed a baby Permit, boy was she excited. Then she landed a small barracuda, she followed that with more bone fish. What a fabulous day, we ended it with a double, my wife caught another bone as I hooked a jack ! My wife, caught and landed; 8 bonefish, 1 permit, I barracuda. 6 more bonefish caught but not landed. Myself, caught and landed; 16 bonefish, 3 jacks and 1 lazy fish(?) caught but not landed; 8 more bonefish and 2 not sure what kind. If you are considering a guide in Cozumel please seriously consider Nacho,Alberto and Nacho JR. They will put you on fish until your arm falls off in the lagoon. We are already planning our next trip. Thank you Daniel, Nacho, Alberto and Nacho JR for a day we will not forget. My day with Nacho produced plenty of action ! The bottom line is that Cozumel is a very underrated bonefish/snook/tarpon spot and if you are in the area and enjoy flats fishing, Cozumel is a must do. My assessment of a good day of bonefishing is based on how many fish you see, and how many shots you get. If I am in fish most of the day, it is a great day. Landing big numbers of fish doesnt happen all that often but if 6-12 fish come to hand I am more than satisfied. My day with Nacho produced plenty of action on bones, and later in the day we chased a few tarpon and snook. I was surprised at the size of the fish, my guide suggested one was 7lbs, I am thinking more like six. Either way a very respectable bonefish anywhere. The bonefish fishing in Cozumel was outstanding ! The holidays in Playa del Carmen were fantastic, and the bonefish fishing in Cozumel was outstanding. I landed 7, with strong struggle, full of adrenalin! Albert was my guide. He is an excellent guide, with a surprising good eye for spotting bones. We had a de-luxe service, punctuality, a good boat and good food and beverages. Besides, Albert is the kind of guides who cares about his clients; apart from fishing, he tries to teach you new techniques and gives you tips to improve. I am very happy and satisfied with the service and the quality and quantity of the fishing. We saw several bonefish schools, but we didnt see any permit or baby tarpon. Cozumel. How much I enjoyed the bonefishing !!!!! Here is a somewhat late reply to say how much I enjoyed the bonefishing in Cozumel. Alberto was our guide. He was great. He saw fish I could have never seen and was helpful and patient given two clients who had never fished for bonefish before. Despite very strong (30-40 km/h) winds which made casting and sighting fish very difficult, we each caught three. Alberto should get the credit. I will gladly return. Cozumel. We had a super time !!!!! Nacho and his son Nacho jr. were both great. We had a super time. If we come to Cozumel agian I will definately want several days with Nacho. Cozumel. We had a super trip! We had a super trip! The weather was great and yes, the fish were cooperative. With much guidance (and patience I might add) from Albert I finally got the hang of it and ended up with 12 bones! I was extremely pleased with the attention and persistence that Albert put into getting us on the fish. He stayed at it very hard all day long. I was hoping for 3 or 4 fish so you can imagine how excited I was to get 12! I will definitely use these guys again if I am in Cozumel! Some of my business associates that were traveling with us used other services and ended up catching NO bonefish. They also indicated that their guide did not seem to care. Not the case with me - I think Albert and Nacho (jr) were as excited as me when I hooked the first one! Thanks for all your help in making this a great trip for me! I will certainly contact you again when I travel to other areas! Attached are some photos of the fish! Cozumel. We had a great day with Nacho !!!!!!!! Despite bad weather, we had a great day with Nacho. He and his son worked very hard to keep us in fish the whole day, and you could tell that he really wanted us to do well, which is all you can ask from any fishing guide. Overall, it was a great experience and I would recommend Nacho to anyone. Cozumel. I had a great time !!!!!!! Daniel, I have been meaning to let you know how it went. I had a great time, even though my casting sucked! Nacho did a great job & put us on a ton of bonefish. I had lots of shots at tailing fish. We saw 1 permit & a few baby tarpon, snook & some big cudas, too. If I go back to Cozumel, lots of other places to see, I will be sure to connect with Nacho again! Thanks! Cozumel. Daniel, Amy and I had a blast fishing with Nacho !!!! Daniel, Amy and I had a blast fishing with Nacho. He was a good guide and put us on a lot of fish. We had a windy day but Nacho seemed to always position the boat just right. I would recomend him as a guide to anyone. Sorry I didn't get back to you earlier, I don't use the internet at home often as I'm on the computer all day at work. 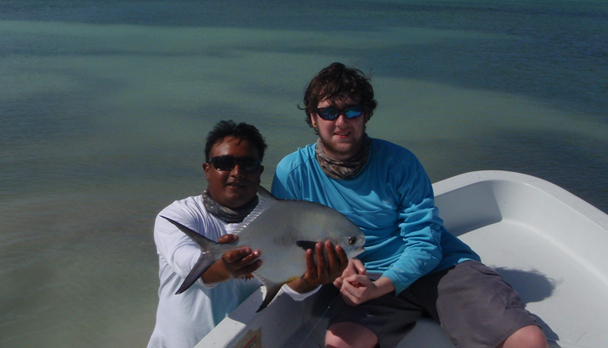 The fishing was great, Nacho gave me lots of shots at tailing bonefish, and I had a couple of shots at permit (no luck with the picky permit though). I caught more bonefish than I've ever had before. I haven't had the pictures developed yet but I'll send you some when I do. If i ever get back to Cozumel again, I'll use you and your guides again! My wife and I enjoyed our Cozumel vacation and the fishing time with Nacho. Everything went as expected. I would recommend Nacho to others wanting to flyfish Cozumel. Thanks for your part in making our vacation memorable. TONY AND I, (TODD) WANTED TO TAKE A MOMENT AND TELL YOU THANKS FOR THE GREAT FISHING TRIP. EVEN THOUGH WE DID NOT CATCH THAT MANY BONE FISH YOU WERE AN EXCELLENT GUIDE. BOTH OF US LEARNED ALLOT HOW TO FLY FISH FOR BONE FISH. WE ARE BOTH STILL AMAZED AT THE VERY LONG FLY CASTS THAT YOU COULD DO WITH SO LITTLE EFFORT. WE WILL RECOMMEND YOU TO OUR FRIENDS THAT COME TO COZUMEL TO FISH. I HAVE INCLUDED SOME PICTURES THAT YOU CAN PUT ON YOUR WEB SITE. I didn't get a chance to give you more info this morning as I just got back to my office from Mexico. Alberto did a tremendous job providing food and drinks (coke, water, Pepsi). He also had all the equipment we required including a rain jacket! He was very knowledgeable about the local area and answered all my questions about bone fishing. He was very professional in handling the boat and treated me with much respect and courtesy. Although I have fly fished for many years and was able to cast with some accuracy I am sure Alberto could help both the experienced fisherman and the novice. As I stated earlier the trip was a huge success for me. Thank you again for the excellent job you did in organizing my day. I look forward to fishing with Fly fishing Caribe again soon. as well as my fly fishing friends. Can't wait to do it again, and please use me as a reference. I've been too busy to get everything written down. trip was of the highest quality. how important and worthwhile it is to spend the money on a quality guide. know I will return to you for guide service for future fishing trips. and relay the message that we had a great day with them last week.